Council of Clermont (1095) - A synod that was held in Clermont, France from November 18th to November 28th of 1095. It was the meeting that launched the Crusades in the Middle East which would span the next two centuries. The year prior, the Seljuk Turks invaded Byzantine territory and were pressing toward Constantinople. Emperor Alexius I Komnenus sent envoys to the West and made a formal appeal for help to Pope Urban II at the Council of Piancenza in March 1095. 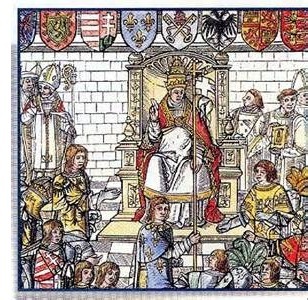 That November the Pope convened the Council of Clermont which was attended by roughly 300 bishops as well as a number of laymen from across France. For the first nine days, other matters were discussed. It wasn't until November 27th that the Pope addressed the situation in the Byzantine Empire. He stood before the members of the council and made what has been described as one of the most impassioned and rousing speeches ever. The reaction must have been greater than what Urban could have possibly imagined. A call to arms went out well beyond France to almost every corner of Western Europe, and by 1096 the First Crusade was underway.